unique and tolerant place where East meets West. A land of colorful spices, picturesque kasbahs, braying camels, desert palms, and friendly people, it teems with diversity on all levels: from classical Roman ruins to Alpine-style villages, cinnamon-colored Sahara sands to sun-blessed Mediterranean beaches, or crowded souks in medieval towns to sophisticated boutiques in upscale cities. 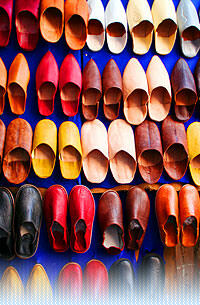 Morocco is also a shopper’s paradise, specializing in the finest quality handmade arts and crafts, whether you are browsing for leather, jewelry, furniture and inlaid wood, carpets, cloth, or ceramics. 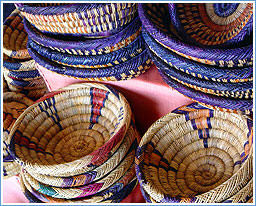 Handmade Berber items are also especially desirable.